Someone, somewhere in book bloggy land once reviewed this and made it sound very interesting to me. Apparently Life Without Limits has just be released in trade paperback by WaterBrook Multnomah and I was asked if I would like to review a copy. I said yes, because I distinctly remember being impressed by Nick Vujicic's story. Life Without Limits : Inspiration for a Ridiculously Good Life arrived in the mail and I instantly tried to ignore the tag line about living a "ridiculously good life." (It just strikes me as overkill in the I'm-so-happy department.) I do like a healthy dose of reality. One can be very happy and very grounded in reality at the same time. (My personality is very muted, if you haven't guessed this about me yet.) Still, I had high hopes and was curious to see what Vujicic had to say. If you have not heard of him, his story is very unique and interesting. He was born without arms or legs. His parents had had two ultrasounds prior to his birth which apparently detected no abnormalities and so it was with some shock that they welcomed their limbless child into the world. At first they fretted and worried about what his life would look like, considering his disabilities. At times, Nick himself wandered the same thing. He wasn't sure if he would be able to go to college, and didn't know if he would get married and have a career like most people you and I know. He did hit a point of despair and briefly considered suicide, but ultimately decided it was better to live. Nick Vujicic was raised in a Christian home and believed from a very young age that God had a plan for his life. It was definitely going to be a different life, but it was a life! This book moves you through his early days, questioning why he was the way that he was and coming to terms with his reality. More than half of the book is focused on his adult years and how he has come to overcome certain obstacles and "live a ridiculously good life" despite of them. Now, in general, I found this book to be quite good and I have no huge reasons not to recommend it. In fact, I think many people could benefit from reading his story and hearing about life from his perspective. As he is quick to point out, he has visible struggles that make people view him and instantly realize that their own personal issues might possibly be overcome. His lack of limbs cause people to listen to what he has to share - because a guy without arms and legs telling you that life is beautiful and in it you can accomplish great things is a pretty hard fellow to ignore! 1. The chief and primary reason that I had a hard time digging in and loving this book is because I have pretty high levels of self-confidence as it is. I would say that this book is written to people who are lacking self-esteem and/or are discouraged with their present circumstances. Vujicic's goal is to cause you to see past the moment - see past the struggles - and trust that God has a purpose for you. Great message, right? But since I am already convinced of that fact for myself, and since this was a point that he made in every chapter and on every page, the book felt like a very long, long pep talk to me. (A pep talk that I wasn't personally in need of.) That said, there are a fantastic and outrageous amount of people on this earth who need just such a pep talk and I doubt that they would find a more enthusiastic person than Nick Vujicic to encourage them. 2. The book did feel like a very long speech. 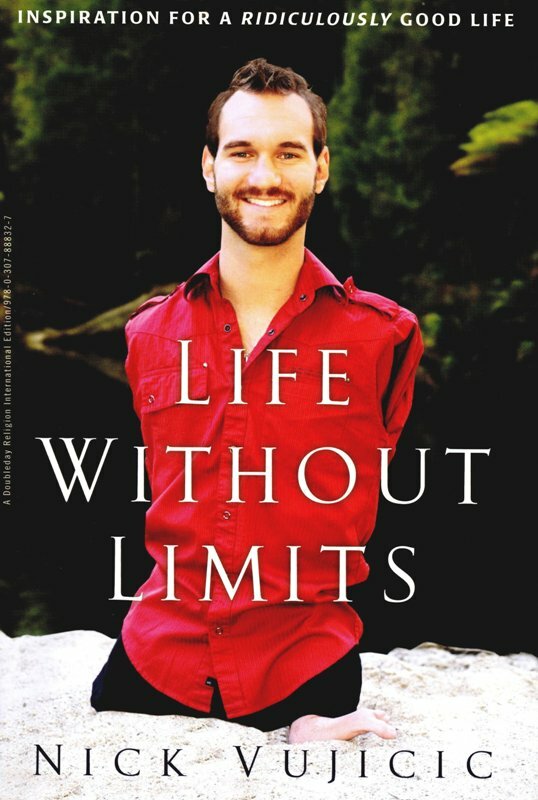 As I discovered when reading this book, Nick Vujicic is an inspirational speaker by profession and that clearly shows. He is very gifted at it. I looked up some of his Youtube videos after reading the book and I actually enjoyed those more (and found them far more impacting) because they were short, to the point and gave you a very clear visual of his "difficulties." So I would say that I would value him more as a speaker than an author. As an additional note - it turns out that Nick just got married this past year! I think that's really awesome and I'm happy for him. Thank you, WaterBrook Multnomah, for sending a copy of this book my direction in exchange for my honest review. And there you have it! My mother-in-law read this, I think, back when she was still reading, and said she couldn't put it down. I wasn't inclined to read it myself, but I can definitely see how it would help to put one's own difficulties into perspective. I'd agree with your theological perspectives. I do see B's point above. It was said even of Hudson Taylor that he prayed as if everything depended on God and worked as if everything depended on him. Overcoming obstacles does involve prayer as well as hard work, but it's with God as a very present help who energizes our labors (in relation to obstacles -- in relation to our right standing with Him, He has done all the work). Or, as someone at my alma mater used to say, "God's not going to do your math homework for you," but He will help you with it if you ask Him. I like this guy a lot, and I might look up some of his talks. I probably will skip the book because I feel like I'd come away with the same conclusions. ....*ahem* also thank you for linking. It made my day! I don't understand how "God helps those who help themselves" is wrong. If it's wrong, then why do we read books teaching us how to be better. "Made to Crave" was at the top of your blog, so I'll use it as an example. If God decides each and every time I eat too much sugar, causing my weight to go up, why read that book? If His plan is for me to be overweight, why bother? Another example: I can pray all I want for alone time in the morning for Bible study, and have it given to me, but I've still got to get my tail up out of bed to take advantage of it. Each and every time I sin, is that God's choice, in your opinion? And, I do very much believe God is holding me in His palm, with great plans for me, as opposed to watching from a distance. But, I've always believed in the saying, "Pray life everything depends on God, and work like everything depends on me." I've had this out from the library but just didn't get to it. It's been on my to read list since. My kids saw him at a youth conference and said he was really inspirational. @Bluerose - I hear what you are saying (about the not arguing bit). Let me see if I can explain my position well. #1 - There is no verse which says, "God helps those who helps themselves." It's a common quip, but it is not scripture. Does God help those who help themselves? No, not always. I could say, "I'm going to help myself win the Nobel Peace Prize and put ten million dollars in the bank with my awesome ability to manage a large corporation." Then i could work towards that goal but that does not obligate God to look down from Heaven and say, "oh. I see someone is working for themselves! I think I will bless that!" He can just as soon say, "Bad idea, Carrie. That's not what I have planned for you." Looking at it more practically even - I might say, "I'm going to go and restore this broken relationship right now. I'm peaceful and persevering. God will bless that." But what God might be saying is, "I value your heart in this, but this is not the time to restore that relationship. I'm working something out in them that you are not aware of. So this relationship is not going to be restored to your satisfaction." I think saying, "God helps those who helps themselves" places the focus on man's ability, instead of God's sovereignty. 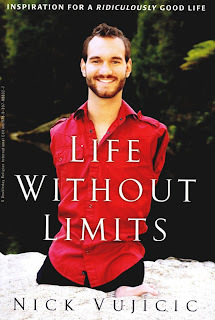 Now, I'm NOT saying that Nick Vujicic should lay in bed day after day and will his arms to grow. "But God, I've willed it!" No, it's not as we would will, right? God said, "Not going to do it. But I DID give you a brain and the gift of creativity and I expect you to use THAT!" We say, "I want" instead of "as God wills" more often than we shoot and I think this popular quip buys into the idea that it's more about what we want, work for and is in "our" power than about what God would will and work out in us. This does not excuse us to NOT work. As I also said, He gave us a brain and told us we should seek after wisdom. But our ultimate help and strength to do ANY work is to be found in Christ. I don't weed my yard and say, "Look what I have done in my power! Now, God make my plants grow!" I say, "Lord, thank you for the land you have given me to work. I pray for wisdom in tending to it, stregnth and ability to keep working in it and I thank you for the profits or the ability to find food elsewhere if you do not grow it here." Again, it turns the focus in the more correct position. I haven't read the book or heard of the author but he does sound very inspirational. On a side note. I love your further explanation on "God helps those who help themselves." I completely agree. :) That's all. Carrie, I like your detailed explanation regarding the theological problems. Perhaps I can add something to that. The phrase "God helps those that help themselves is indeed, not a Biblical concept. Like a few other things we think we know, this one isn't in the Bible. The concept actually stems from Greek philosophy. The earliest known form of the saying is found in Aesop's fable, "Hercules and the Waggoner." (c. 600 BC) The fable is mentioned by various philosophers as standing for the proposition "The Gods Help Those That Help Themselves," which is how the phrase entered the vernacular. "For it is commendable if a man bears up under the pain of unjust suffering because he is conscious of God. But how is it to your credit if you receive a beating for doing wrong and endure it? But if you suffer for doing good and you endure it, this is commendable before God. To this you were called, because Christ suffered for you, leaving you an example, that you should follow in his steps." I would interpret this as having an application in our dealings with adversity. If we are suffering because of our "poor me," helpless attitude, we are not doing right. If we fail to use the knowledge and strength that we have, we are adding to our own problems. So I agree wholeheartedly with your explanation. I'm with you on the pep-talk problem. I'm leaning toward thinking that this is in part an introvert/extrovert thing. I have a limited tolerance for excessive emotion in any direction, because it exhausts me.